The adaptation of consumer digital cameras to the microscopic light path again and again poses a challenge. During the past years I could test a lot of adaptations and gain experience with the different techniques. 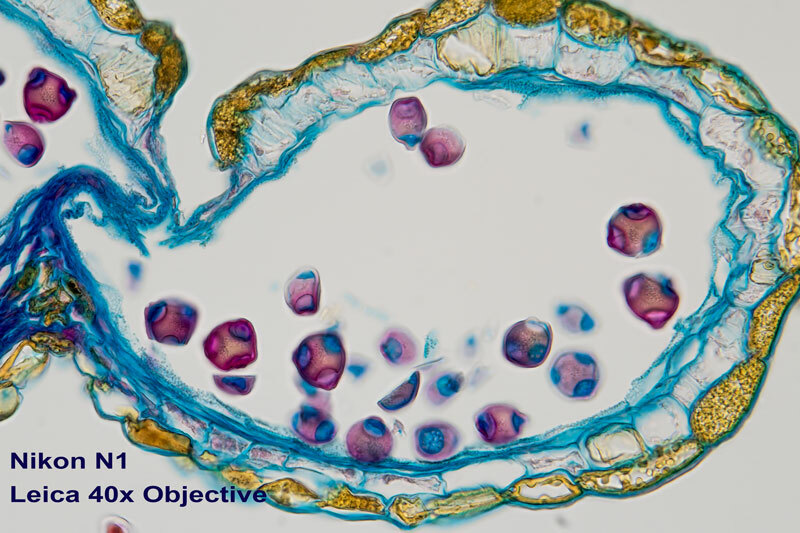 Modern microscopes frequently use the C-mount port for documentation with specialized microscope cameras, often with extreme high costs. At the other end there are old stock standard-adaptations for 35mm analogue film cameras. These adaptations often are mechanically complex and sometimes not available for a certain microscope model, apart from the Zeiss microscopes. 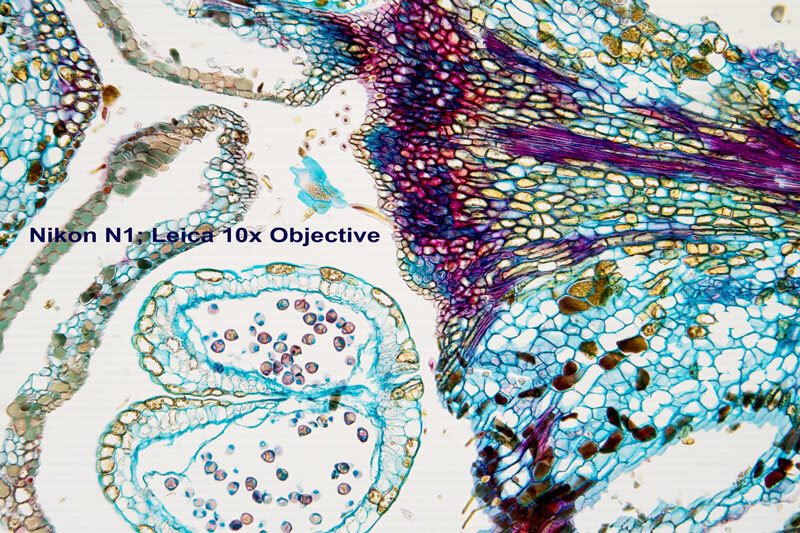 Zeiss offers a wide variety of adapters for their microscope models. As a matter of principle all cameras with interchangeable objectives can be used for adaptation to a microscope. The only problem to solve is to match sensor size with the microscope picture at the end of the light path. 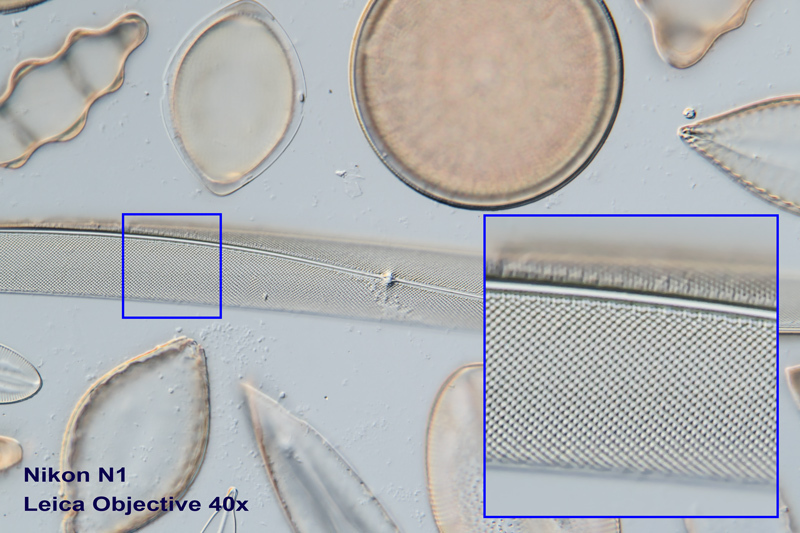 With a small camera sensor the intermediate picture of a microscope can be captured. With a full format or APSC sensor you have to use matching relay optics. In this short field report the explanations are restricted to the direct usage of the intermediate picture in modern microscope optics. Before 1980, microscope optics often show intermediate pictures with chromatic and/or spherical aberrations with the need for special projection eyepieces. In this scheme I used a Nikon Coolpix 990 to capture a stage micrometer through my oculars with a field number of 22. A photo graticule took place in this ocular too. 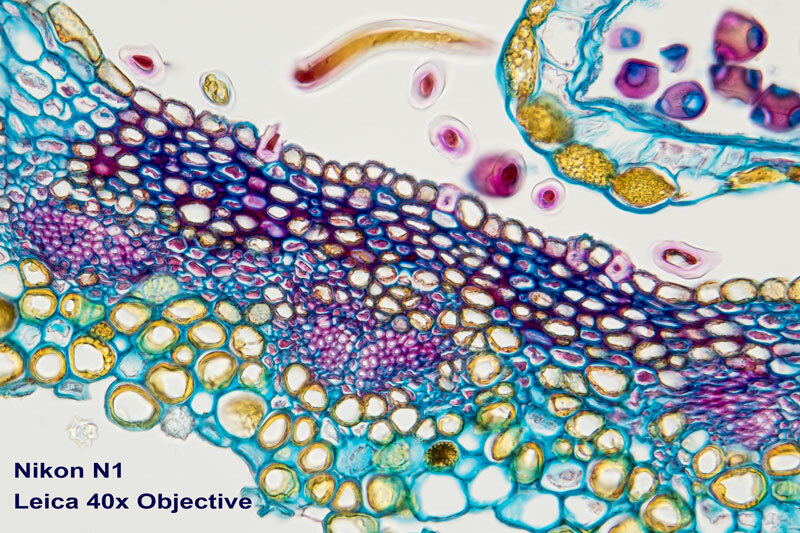 The picture represents exactly what you see when looking into the microscope. I added frames for the captured areas with different sensor sizes when taking the intermediate picture of the microscope without any relay optics. The Nikon N1 sensor size with the appropriate captured area for the Nikon N1 matches very good to the graticule marks and the best image quality center of microscope objectives. When you look at the pictures on your monitor after captioning, the sizes of the objects are as seen through the oculars. 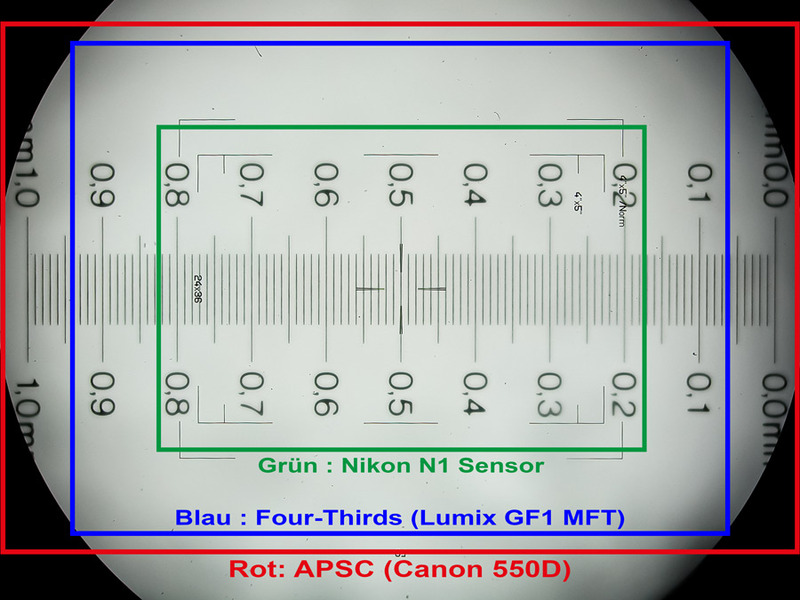 When using different camera sensor sizes, e.g. FT or APSC, you have to crop the resulting images or take a higher magnifying objective. The size of the N1 sensor goes well with the intermediate picture of modern microscopes, but what about the resulting image quality ? 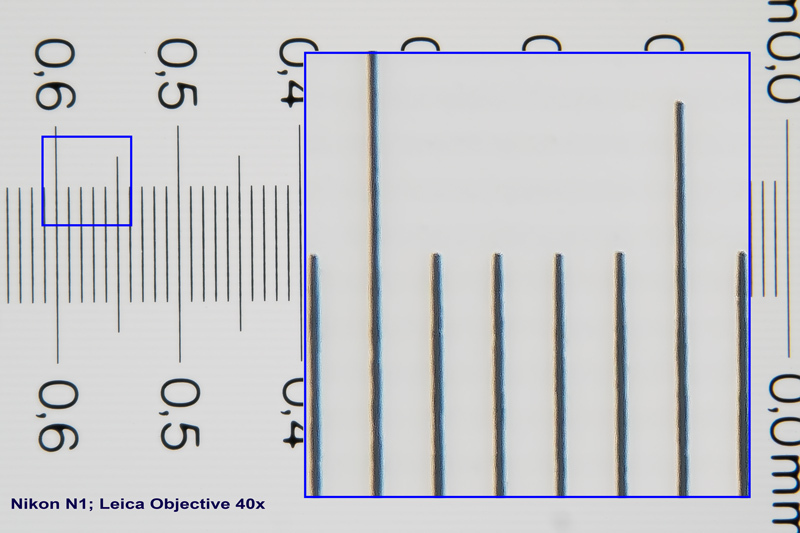 As a matter of principle small sensors with resulting small pixel sizes show stronger noise and less dynamic range compared to sensors with bigger sizes. That is a fact for the older N1J1 model, but not for the N1J5. There has been a broad improvement in image quality with the new 20 Megapixel back side illuminated sensor of this little camera. If you look at several camera reviews for that model in the www, you will find this confirmed. Please refer to these review articles for more technical details. Assembly on a Leica DMLS microscope trinocular tube. Assembly on a Leica DMLB microscope. Ergonomically working with the camera is easily done with the tiltable control monitor. The control monitor works like a smartphone-camera, it is touchable and when using on a microscope with a little concentration shaking is prevented simply. Additionally the shutter release can be done with a smartphone or tablet APP called Nikon WMU via nearfield WLAN. Unfortunately the camera shutter does not work with the APP without a AF confirmation chip installed. Nikon WMU is a very simple App. A fully electronic shutter works inside the Nikon N1J5, there is no mechanical shaking, a perfect feature for usage on a microscope. Unfortunately the infrared shutter release does not work anymore with the J5, all has to be done via the WMU App. But I think, you can get over these little disadvantages when you see the price of about $500 for all components for a fully working documentation solution. To show some features of the little camera, some example pictures are shown here. This is a stage micrometer captured with a 40x objective to visualize chromatic aberrations if any with the high contrast edges. Obviously the intermediate picture is well corrected, no colored borders are visible. The four brightfield images of thin sections show crisp and clear details. 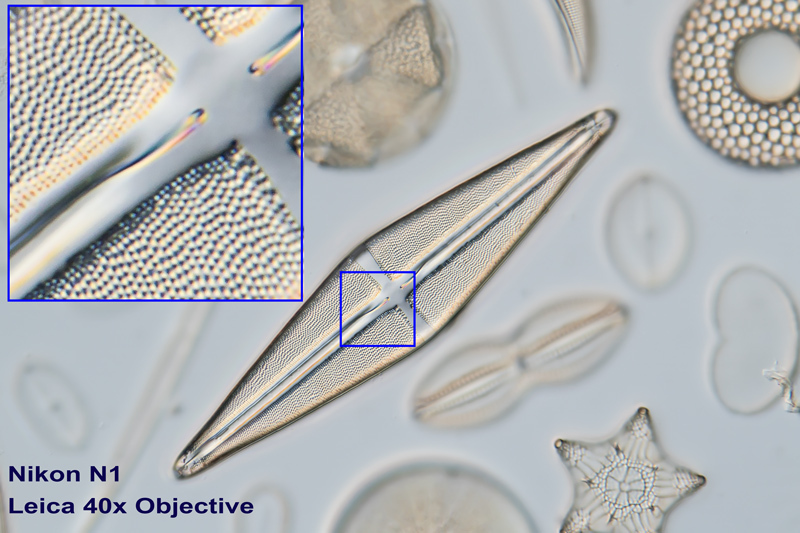 Diatom frustules are traditionally used to test microscope optics and the appropriate image capturing chain. The very fine structures make great demands on the optics and camera adaption as well. All images were taken with a 40x objective in differential interference contrast. 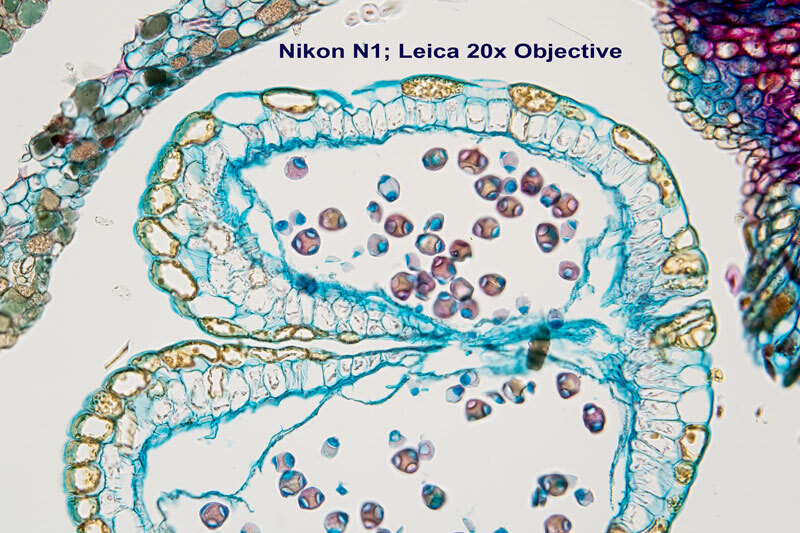 Overall the shown photomicrography system with the Nikon1 J5 gives a moderate-priced solution for perfect publication results. The Smartphone-like intuitive usage makes it easy to work with as well. 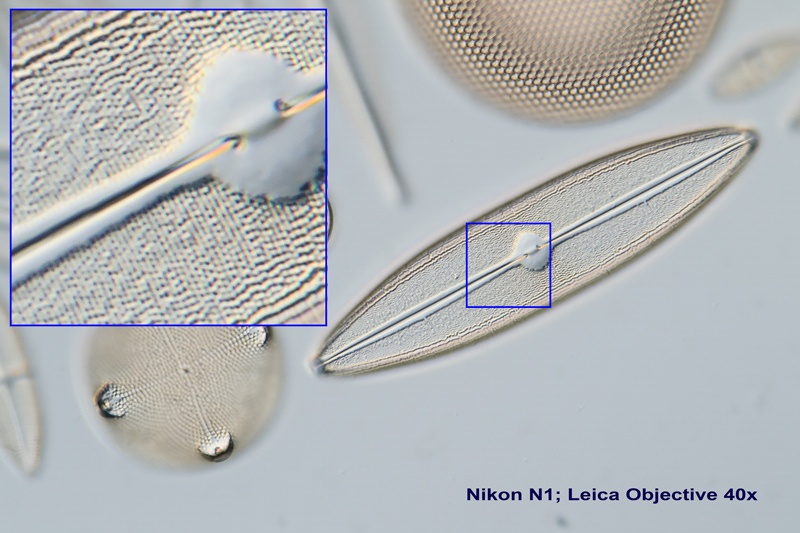 Photomicrography with the Nikon1 J5 made easy.